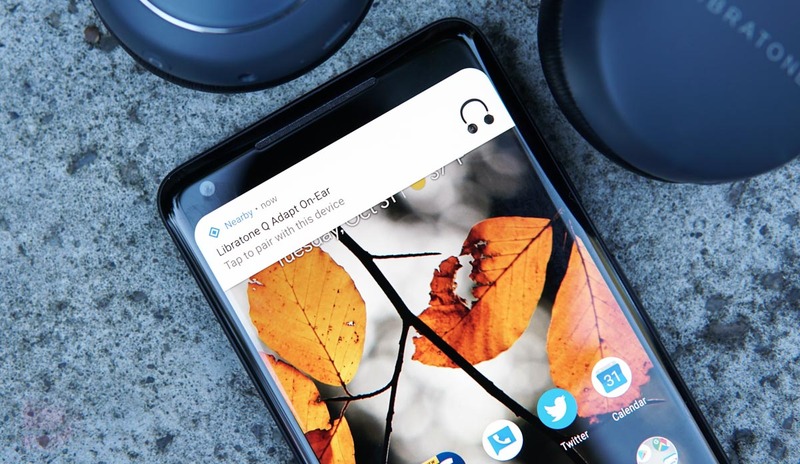 Starting with Google Play Services 11.7+ (and Android 6.0+), Android users will be able to take advantage of Google’s new Fast Pair service that turns Bluetooth pairing into a hassle-free process. You’ll also need compatible Bluetooth devices, but we’re already seeing several arrive on the market, including Google’s new Pixel Buds. With Fast Pair, Google’s Nearby service scans for nearby Bluetooth Low Energy (BLE) broadcasts within a close proximity of your phone and then asks if you’d like to pair. A simple tap on the notification that pops down (see below) will then finish up the pairing process for you. Once done, it may even recommend a companion app if there is one, through a second notification. Otherwise, you can immediately start using the connected Bluetooth device. This – obviously – eliminates the need to go into your Bluetooth settings, tap the “Scan” or “Pair new device” buttons before waiting for your new Bluetooth device to show up in a list, tap on it, enter in a pairing code, and then hoping all finishes up. Additionally, when your phone recognizes a nearby device, it’ll ping Google’s servers to get an image of the product to show you within the notification. That’s kind of cool and happens instantly. Again, you’ll need hardware that works with Fast Pair and so that means Bluetooth device makers need to build this stuff in. Right now, we’ve got support with the Pixel Buds amd Libratone Q Adapt On-Ear headphones (pictured above). Google says to expect the Plantronics Voyager 8200 to support Fast Pair too.